Andy Kirk is a UK-based data visualisation specialist. 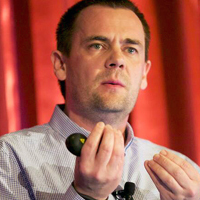 He has been a freelance professional since&nbsp;founding Visualising Data Ltd in 2011 and has been the editor of award-winning website www.visualisingdata.com since 2010. Andy provides design&nbsp;consultancy and delivers training workshops to organisations across all industries all around the world. He is a visiting lecturer on Masters degree programmes at the Maryland Institute College of Art (MICA, USA) and Imperial College, London.